Sideline Sports Doc, a Players First partner supporting the Player Health & Safety pillar, held a live broadcast April 3 at 12 p.m. ET on US Club Soccer's Facebook page to present its recently launched app, Good to Go. Created by head team physicians with decades of experience in multiple college, professional and national teams, the "Good to Go" app uses Sideline Sports Doc's SAFE Method™ decision algorithm to help you make the right assessment for any injury you or your child picks up on the field. 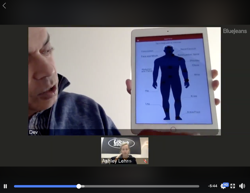 In the video above, Sideline Sports Doc founder Dev Mishra discusses how Good to Go can just take 1-2 minutes to help you decide whether you need a bag of ice, can return to play or need to see a doctor immediately. In October, US Club Soccer and Dev Mishra held another live webinar on Player Health & Safety.